Photos by John Reynolds (right), Josh Silberg (top left), and Christian Kelly. Wilson's warbler is a small bird with a yellow belly, throat, and face, an olive back and wings, and a darker tail. It has a light-coloured bill and orangish feet. The distinctive black cap seen in the above photo is typical of the male, and may be absent or less distinct in females and juveniles. This bird is bright yellow in the western of North America, while eastern birds are duller. 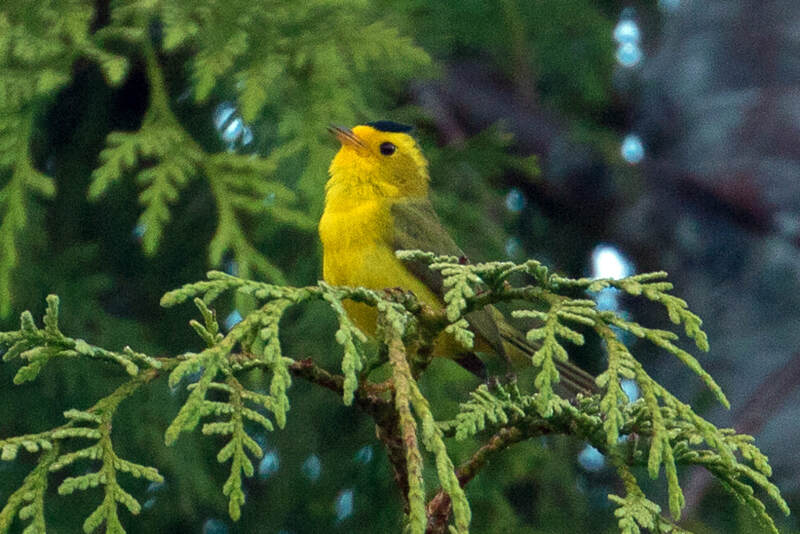 Wilson's warbler ranges across North and Central America, spending winters in Central America and migrating across the United States to winter throughout most of Canada. It is more common in the west, and nests in woodlands, bogs, willow thickets and brush near streams. 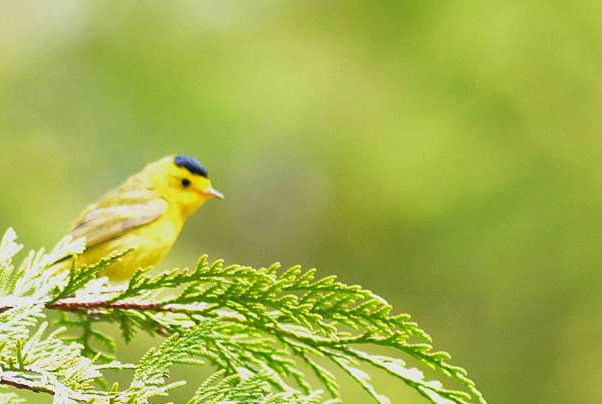 Most species that are similar to Wilson's warbler do not range to the Central Coast of BC, excepting the yellow warbler and orange-crowned warbler. 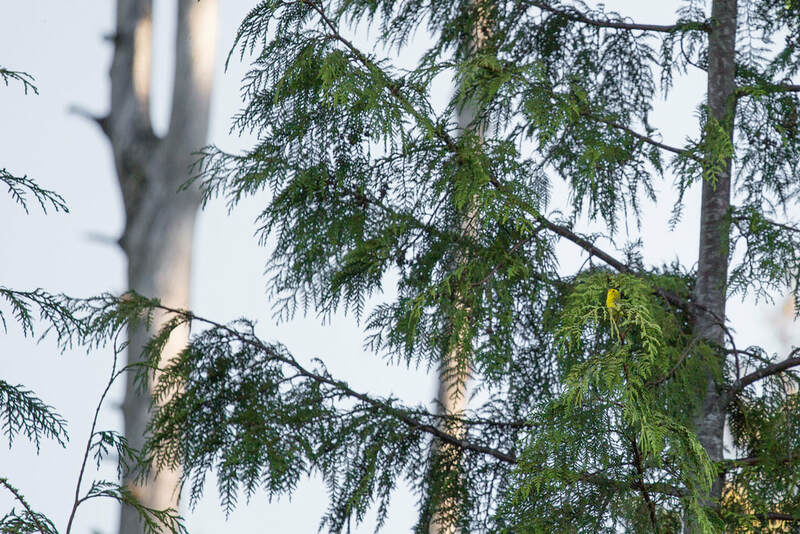 The yellow warbler is quite similar but lacks the black cap of the male Wilson's Warbler. The male yellow warbler male also has orange-red streaks on its undersides, and its wing feathers are outlined with yellow. The orange-crowned warbler is much duller than Wilson's warbler, and its whole head and back is an olive colour. Dunn, J. L. and Alderfer, J. (Eds.). (2006). National Geographic Field Guide to the Birds of North America. (5th Ed.). Washington, D.C.: National Geographic Society. Pp. 392-393. Wilson's Warbler (Cardellina pusilla). The Birds of North America Online (A. Poole, Ed.). Ithaca: Cornell Lab of Ornithology; Retrieved from the Birds of North America Online. Accessed 19/02/2013.